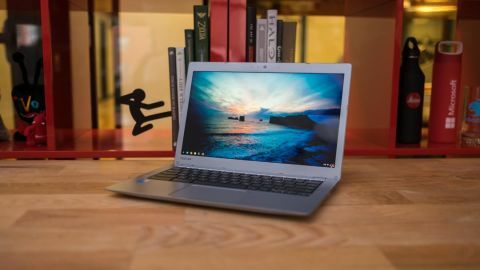 A little short on battery life and savings, this updated, thin and light 13-inch laptop is the best, fully-loaded Chromebook for the average user. Chromebooks have come a long way from their humble beginnings. First started as an experiment for affordable cloud computing, manufacturers have been stepping up the hardware to include full HD displays and even Intel Core i-series processors. The Toshiba Chromebook 2 was one of the first models to really shake things up with a vibrant 1080p display, and now it's back with an added Broadwell Core i3 processor and a new backlit keyboard. Unfortunately, the new premium components come with a slightly inflated $429 (about £299, AU$612) price tag, putting it in the cross hairs of premium Chrome OS notebooks, like the Google Chromebook Pixel and Dell Chromebook 13. The refreshed Toshiba Chromebook 2 is largely the same as its Celeron-powered predecessor from 2014. In fact, it comes sporting nearly the same chassis with matching dimensions. While it looks the same from the outside, going with a Core i3 processor means Toshiba had to put a cooling fan in. As a result, this notebook is 0.02 pounds heavier, but who is really counting at this point? The Toshiba Chromebook 2 is still one sleek, plastic package whose front end tapers gradually into a thin edge. The corners of the laptop come to a sharp, square angle, which adds to the Chromebook 2's edgier look. The outside surface also features a finely dimpled texture to make it far more unique compared to most other smooth-skinned Chrome OS machines. Overall, the Toshiba Chromebook 2's aesthetics are neither egregious nor do they look like it was made on a flimsy budget. That said, this 13-inch Chrome OS machine is not going to turn any heads when you pull it out of your bag at the cafe. A the end of the day, this is still just a gussied-up, plastic notebook. The only knock I have against the design is that the underside is made with a piece of lighter-gray plastic, while the rest of the device is painted in a metallic silver. This mismatching color sticks out from the otherwise completely silver body, as if the laptop was mistakenly built with the wrong bottom panel. Along the right side of the device is an HDMI port to plug in your Chromebook to an external monitor or HDTV. Additionally, on the right side of the laptop is one USB 3.0 port for high-speed data transfers. On the opposite side, there's a USB 2.0 port for a mouse or any other peripherals – not that you'll need them. The keyboard is more than serviceable, with a traditional layout, and the keys are backlit, too – a rare feature for Chrome OS devices. Just below the keyboard, the trackpad is sizable and clicks with precision.